Karnan Perumal and his wife Rajeshwari from Tamil Nadu, India, were delighted when she gave birth to her a son Rahul on May 22, 2013. On the ninth day of his birth, Rajeshwari suddenly heard Rahul screaming from inside the hut and ran into the house, where she saw the cotton cloth covering his abdomen, on fire. The couple immediately took their son to hospital, but the doctors were mystified. Later, the parents returned home, hoping this bizarre and disturbing occurrence would not repeat itself. A few days later, his stomach, thighs and legs suffered 'spontaneous' burns and their thatched roof hut was also partially damaged in the fire. After spending a fortnight at the government hospital, the trio went to Karna's parents home and live with them. 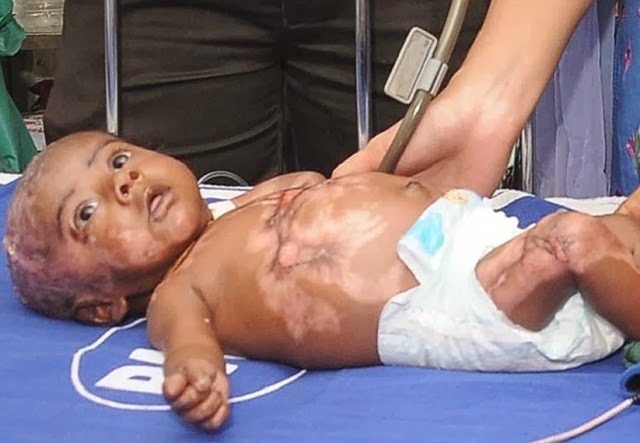 Rahul burned a third time on July 31, As a result, the family have now been forced to move from their village, due to their neighbours’ fears that the baby could cause a serious fire. In the first week of August, Rahul caught fire again. The couple took the child to be examined at a hospital in the city of Chennai, where the doctors are equally baffled. Exact cause of burn have not ye been identified even after series of tests. The doctors are now considering baby Rahul might be a victim of one of the strangest and most mysterious of phenomena — spontaneous human combustion. Spontaneous human combustion (SHC) is a term that refers cases of the burning of a living human body without an apparent external source of ignition.